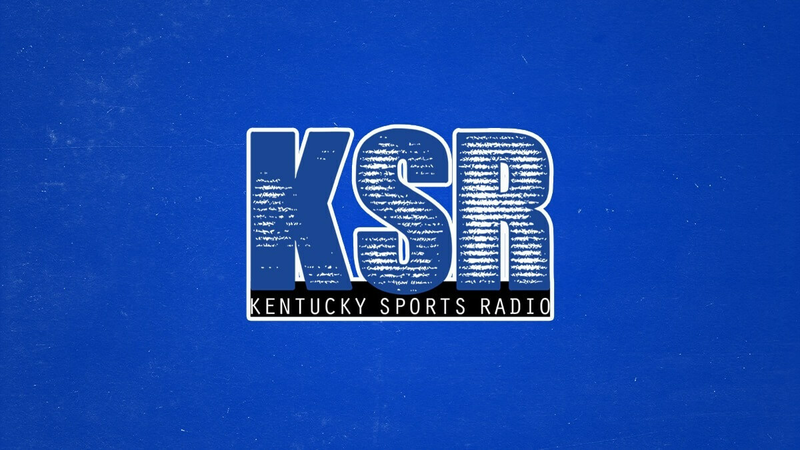 Good morning, friends, and welcome to the Monday edition of Kentucky Sports Radio. Today, the gang will recap Matt’s roast, Calipari’s latest recruiting moves, and Friday night’s Spring Game. Tune in or miss out. But, you get a silver medal. Yes! Hopefully your batteries are fully charged for your 20 hour a day workdays! A quick note about the spring game: yesterday I was listening to Sunday Morning Sports Talk and Mark Burger (sp?) made a good point. Stoops had said the old standard “We’re bigger, stronger, faster, but need work.” Burger said every coach says that in the spring. I thought, “He’s right! No one has ever said ‘We’re smaller, weaker, slower…'”. My head is in this picture. #blessed. Hey dude! Long time no see! If we had a full show thread the way we did when you were a frequent poster we could give Matt quite the roast. You should be the moderator since you’re one of his Transy buds. A ‘real-friends’ KSR roast would not be for public consumption in any way. “Not fit for public consumption” is the best kind of roast. Matt doesn’t understand reclassification? I’m not referring to understanding all the minute details of eligibility, but I thought he was the one who once said that they’re able to reclassify, usually, because the player was held back 1 year to give him more time to develop. Is that not correct? Of course there may be the occasional player like Brandon Knight who was so brilliant that he probably could have gone to college early based on academics. Dwight Anderson was one of our fastest players, ever. But he thought he was a running back, and transferred to Southern Cal. Boy, did we love Dwight Anderson. Was it Al McGuire who declared, “A star is born!”? Well, slower ST than usual today. Someone else take the wheel for a few! Surprised I have heard no mention of Bevin totally putting his foot in his mouth on Friday. And then he followed it up with his “sorry, but not sorry” apology on Sunday. The “art” of politics is lost today. I try to not go into politics here too much. Whether you support him or not, you have to agree that this was a poor choice of words at best. To try to place blame on the teachers for using up a personal or sick day to travel to Frankfort to protest funding cuts that affect their students is misplaced. I think that public pensions are doomed to the same fate as the dodo bird, but I can certainly appreciate why they are upset. Bevin’s vile remarks are his usual brand of crap. He’s been bashing teachers for some time now, however, I don’t see Bevin or any other politicians cutting their own pensions or healthcare. Cuts to benefits are just for us constituents. I don’t know enough about the situation in Kentucky to comment much since I don’t live there, but teachers (read: their union) have a history of fighting against accountability standards and such, so I generally don’t take their side, and I don’t support them walking out. Many comments I’ve seen indicate that Bevin was left a mess by previous admins kicking the can down the road and now he’s having to take the heat in trying to clean it up. I don’t know if that last statement is totally true, but I believe there is probably at least some truth to it. Either way, what he said was totally inappropriate and it distracts from the issue at hand. I think Bevin truly thought that he could come in and “fix” the pension problem by approaching it from the perspective of a businessman, which is what he is. However, he totally underestimated the political dynamite he was playing with. He was messing with a bunch of mama-bears who are not going to back down. cg, I am sure that there are some teachers who may not want to be held accountable for what goes on in their classrooms, but I think the majority of them are doing a somewhat thankless job for relatively low pay when you look at the stress put on them, especially the ones who have to work in schools where the parents refuse to actually parent their children, instead expecting the schools to raise and discipline them. We DEFINITELY have a parenting problem, for sure. My daughter’s kindergarten teacher was kind of visibly taken aback when my wife told her to not let her get away with anything and to tell us if there were problems. They don’t hear that from parents much today. Teachers in KY don’t have a “union”, it’s an “Association”. Unions are able to collectively bargain and call for a strike. The Kentucky Education Association doesn’t have authority to do either of those. The only way education in Kentucky is ever going to be fixed is for the accountability to be shared by the students and parents, not just the teachers. No skin in the game = no effort. Sounds like my kind or timing. Had tickets to a Pels / Heat exhibition game in Louisville a few years ago, and Birdman did not play at all for Miami and AD left the game in the first quarter with a wrist injury. Did get to hang out right behind Pat Riley, however. There is so much to do in N.O. you want even think about the game after you get there. Has KSR done any coverage of the new 25-yard touchback rule in NCAA football? I know they did it because a couple of guys have been severely injured on special teams, but they really are taking a big part of the Chess aspect of football out of the game. Maybe they did need to make a change, but this change is terrible. What they should do is if both teams agree, just put it on the 25 and forget the kick in the first place. It’ll save time. All kickoffs go past the 25 anyway except a very rare shank. If they don’t agree, then kick it off. I think it’s pretty clear they’ll take kickoffs & punts out of the game altogether eventually. I could almost see the logic in doing away with kickoffs, but punting is too much a part of the strategy of the game, I think. I think some people look at the cut rate airlines the same way they look at the $250 LASIK eye surgery. Do you want to cut corners on something as important as your eyesight? That being said, 99.9% of the time, everything will be fine. It’s that 0.01% that is the problem. If you are looking at it from a purely actuarial perspective, even flying on the Red Baron Express is probably safer than driving the same route, when you look at the statistics. It’s just the feeling of completely giving up control of your own fate that turns people away. Oh, and that free falling from 33000 feet thing. Can’t believe I am looking out my window watching snow pouring out of the sky, when 3 days ago it was 80* outside. Welcome to the Ohio Valley!